AMMONNEWS - Deputizing for His Majesty King Abdullah II, HRH Prince Hassan bin Talal on Thursday began a visit to New Zealand following the terror attack on two mosques in Christchurch last Friday which claimed the lives of dozens. 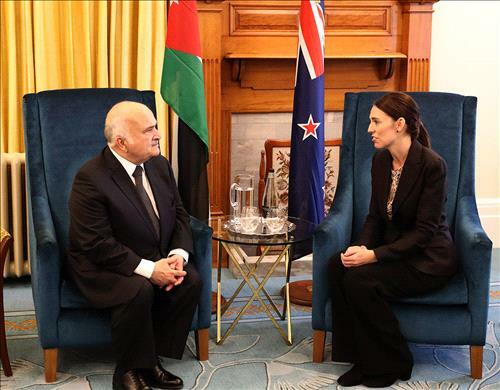 Prince Hassan met with New Zealand's Prime Minister, Jacinda Ardern, at the government's headquarters. During the meeting, the Prince passed on King Abdullah's condolences over the victims of the terror attacks, adding Jordan condemns such acts which contradict humane values. He also lauded Ardern's stance in dealing with the fallout of the Christchurch shootings. Prince Hassan discussed the efforts the Kingdom is exerting in defending Islam, which calls for moderation and tolerance, pointing to initiatives Jordan has launched to enhance interfaith dialogue, foster harmony among religious followers, and combat extremism. He underscored the importance of focusing on shared humane values, which contribute to boosting cooperation and respecting the "other," and enhancing security based on equality, justice, brotherhood, and citizenship. Ardern commended Jordan's efforts, under King Abdullah's leadership, to boost dialogue and human solidarity, calling the recent terror attack "an attack on all of New Zealand and not just the Muslim community." HRH Princess Rahma bint Hassan and Foreign Ministry Secretary General Zaid Lozi attended the meeting.